Bunny and Brandy's Brunchtime Blog: Sun Basket: The Best Clean Eating Meal Prep Delivery Service? Sun Basket: The Best Clean Eating Meal Prep Delivery Service? I've been curious to try some of the meal prep delivery services that have sprung up in the last few years. The convenience is certainly the main draw for me, but I've noticed that the recipes some of these companies put together aren't always the healthiest or the most inclusive of different diets. Also, I've heard from friends who have tried different services that the packaging can sometimes get out of hand, causing much more waste than a trip to the grocery store would have. Recently, I decided to finally bite the bullet and give one of these services a try. Sun Basket caught my attention right away because they featured several different meal plans (vegetarian, vegan, pescitarian, paleo, gluten free, family, etc) but also allowed users to jump across the different menus. As an omnivore who tries to limit her meat and carb intake, I loved that mixing and matching was an option. They also promised all organic produce and responsibly raised meats as well as fully recyclable packaging. For my first week of recipes, I picked a Steak and Stone Fruit Salad, some Smokey Chicken Tacos with mango salsa, and Tofu Burgers with potato match sticks and corn on the cob. right off the bat, I was really impressed with how efficiently set up the box was, with all the ingredients for each recipe packed into a labeled brown paper bag so that I didn't have to wonder what belonged to what. Both the chicken and the steak were put in a separate compartment, securely packaged, well trimmed, and looked vibrant and fresh. Best of all, the booklet that came in the box contained recipes for not only my meals, but all 18 meal options on the menu for that week, meaning I could still try to make all the meals I didn't pick on my own! I decided to make the Smokey Chicken Tacos for my 4th of July dinner (because nothing says 'Merica like tacos). Being that this recipe included two of my not so favorite thing- cilantro and jalapenos- I was a little worried that leaving them out would make the tacos bland. I was wrong. Whatever the magical spice mix they gave me was was so flavorful and perfectly balance that I didn't feel like I was missing out on anything. My friends, who were trying the tacos with me, were also able to customize their tacos to their individual tastes by adding the cilantro or jalapenos as they wished. I was immediately impressed. Next up was the Steak and Stone Fruit salad. Now, these boxes are meant to feed 2 people (or more if you choose the family plan) and since I live by myself, I figured I could split some of the more filling meals into dinner and lunch. I wasn't planning to split this one, since... well, it was a salad. But when I saw the two generous cuts of steak they had given me, I changed my mind. In fact, every meal I received was enough to make two filling portions. And that's saying something for someone with an appetite like mine! The salad was super easy to prepare and I loved the addition of the charred peaches, though I would have loved a little bit more of them. The steak itself was top notch, which is pretty impressive considering that every serving only runs about $11.99. I modified this recipe slightly by candying the walnuts that were meant to top the salad, just to give them a little extra crunch. The tofu burgers were my my least favorite of the first three meals, though through no fault of their own (they were against stiff competition). 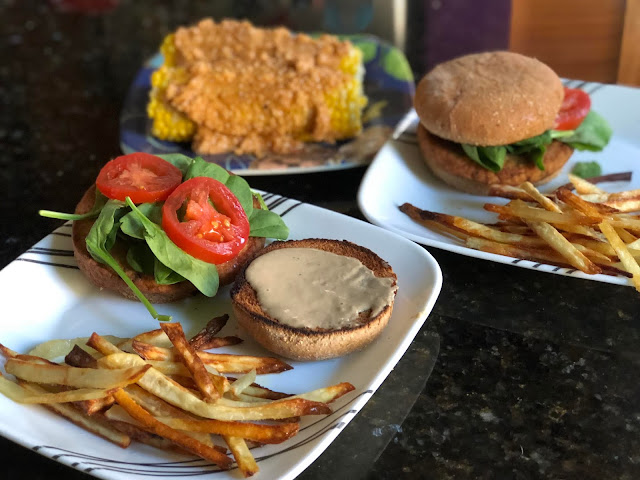 Funnily enough, this meal was the most involved recipe, requiring a bit of prep with the potatoes and the various veggies that were to top the burger, then the baking of the potatoes, the boiling of the corn, and the grilling of the tofu burgers. I made my meal slightly not vegan by adding the little spice mix they had given me for the corn to some mayonnaise and Parmesan cheese to make the corn into elotes, but I stuck to the rules for everything else. The burgers were substantial and the texture of the tofu was perfect, but the cashew cheese sauce wasn't as flavorful as I had hoped it would be. The second week's box brought me a Warm Quinoa and Corn Salad, some Pulled Pork Sliders and Carrot Slaw, and a Saigon Noodle Bowl. As should be obvious by now, Sun Basket features a lot of international recipes, which I loved, since I have a tendency to stick to very westernized flavor profiles when left to my own devices. The pulled pork sliders came with Carolina mustard BBQ sauce, which packed quite a bit of unexpected heat. This was the only meat dish I ordered that came pre-cooked and frozen, but I was still really satisfied with the texture of the final product. The slaw was supposed to be a mix of carrots, celery, and raisins, but I decided to leave the celery out (because celery is the worst vegetable EVER) and I was perfectly happy with the results. The Noodle Bowl turned out to be my favorite of this crop of recipes, thus proving that I do actually enjoy vegan food. The braised tofu they sent was the perfect firm texture, and I loved that the recipe called for making my own scallion oil to pour over the noodles and veggies. This recipe in particular I really want to try recreating. Lastly was the Warm Quiona and Corn Salad. I ordered this one mostly because I liked the sound of the ingredients, but I wasn't sure how they were going to go together. The fresh burst of flavor this salad produced was a welcome surprise. The sweet corn, zucchini and quinoa were to be simply dressed with some lemon, oil, and mint, then topped with crushed hazelnuts and fresh ricotta, all of which combined in a really pleasing blend of textures. Definitely a wonderful summer dish that I would love to make again for a backyard BBQ. So, the ultimate question is: Would I recommend Sun Basket? 100% yes.I went in very skeptical about the quality of the ingredients, the thought behind the recipes, the ease of preparation, and the size of the portions, all of which I was extremely impressed with. If fact, I'm thinking of doing the paleo meal plan moving forward so that I have a built in way of cutting some carbs out of my diet every week. Lord knows I need some kind of device for stopping me from eating pasta all the time! The products mentioned in this post were sent to me free of charge by Sun Basket, but all opinions are strictly my own.